National Plan for Vacation Day, celebrated on January 29, is a day meant to encourage Americans to plan their vacation days for the rest of the year. The list of ways to relax and have fun is endless in Daytona Beach, guaranteeing your time off will be well spent. From paddleboarding to biking on the beach, and from shopping to seeing a live performance, a trip to the area leaves you recharged and rejuvenated. And, by planning at the start of the year, you’ll have something to really look forward to in 2019! Luckily, Daytona Beach has a wide variety of great deals on accommodations for every price range. Better yet, the whole area is known for its great value in dining, attractions and more. The attractive price point, plus early planning, means you can enjoy a wonderful getaway in 2019. Actually, taking time off has consistently been associated with higher productivity and performance. People who take vacation are more likely to have a positive attitude toward work, increased happiness, and improved mental and physical health. And the further in advance you plan, the easier the transition back into work will be. Studies have consistently reported that vacation is essential to strengthening personal relationships, inspiring creative thinking, improving professional performance and promoting better health. Perhaps more importantly, remember that vacations are not a waste of time — they are an investment in you, in your relationships and in your family. Time spent together apart from the daily stresses of appointments, errands, chores and work can be so precious to a family. In sum: It’s worth it. Fortunately, getting to Daytona Beach is a breeze! If you’re coming by car, Daytona Beach is conveniently located where two major interstate highways intersect — I-4 and I-95. This makes our beaches extremely accessible to car travelers, and a straight shot from many directions. For those traveling by air, Daytona Beach International Airport offers direct flights on major airlines such as Delta, American Airlines and others. Most recently, Sunwing Airlines launched a direct flight from Toronto — marking the first time ever that Canadians can enjoy an easy, direct flight to Daytona Beach International Airport. In fact, Sunwing is the only Canadian carrier to offer direct flights to Daytona Beach. To top it all off, our airport is just a few short miles from the beach — meaning you can go from baggage claim to laying in the sand in no time. Dad wants to golf, the kids want to try some sort of new adventure, Mom wants to have a moment of peace at a day spa, and Grandma is itching to go shopping. We hear you — it’s hard to find a destination that the whole vacation crew can get excited about. In Daytona Beach, there truly is something for everyone. Spend the morning paddling the waterways, getting a little exercise and sightseeing simultaneously. Or, take a free tour that satisfies your sweet tooth at Angell & Phelps Chocolate Factory. Go for a family bike ride along 23 miles of beaches, savor a waterfront meal together, or get hands-on learning at the Marine Science Center. From its vibrant arts and culture scene to the myriad of outdoor adventures that await, Daytona Beach is the ideal getaway for any age group. Read our suggested activities for every age group — you’re sure to find something that suits everyone your family. 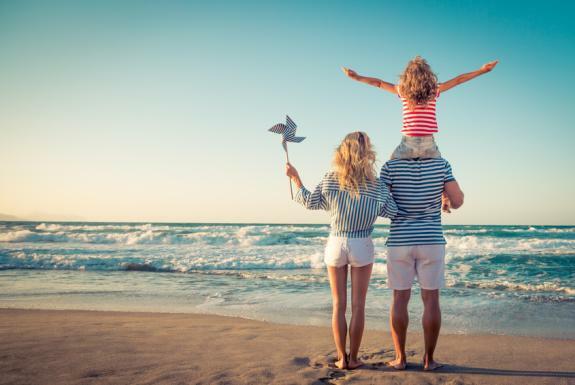 Besides the new discoveries you will make, a vacation in Daytona Beach is a priceless opportunity to reconnect with those who matter most to you. Unplugging from the daily grind and refocusing on what matters is important to maintaining a healthy work-life balance. It can even be beneficial to your career to go on vacation. Furthermore, the Project: Time Off study showed that employees who take their vacation time were more likely than vacation forfeiters to have been promoted within the last year (27% versus 23%) and to have received a raise or bonus in the last three years (84% versus 78%). The bottom line? Work hard, play hard. It’s clear that vacation time is valuable for our well-being, relationships and health, so what’s holding us back? For 51% of Americans, it’s due in part to skipping the first step that could help them take a vacation: planning. Individuals who plan are more likely to use all of their time off — it’s that simple. So join National Plan for Vacation Day on January 29, and declare your vacation days for 2019. Want to get a head start? Use our trip planner to help create the perfect trip today!